USDA is forecasting 2019 world pork production will be 1.4% above this year, which in turn is expected to be 3.8% above the level of five years ago. World population grows about 1% per year, so the growth in world pork production is roughly in line with population growth. That comes from the USDA’s Foreign Agriculture Service updated world pork forecast in the annual “Livestock and Poultry: World Markets and Trade,” which was released last week. China has probably been the world’s largest pork-producing country for as long as China has been a country. This year, China is expected to account for 48% of world pork production. 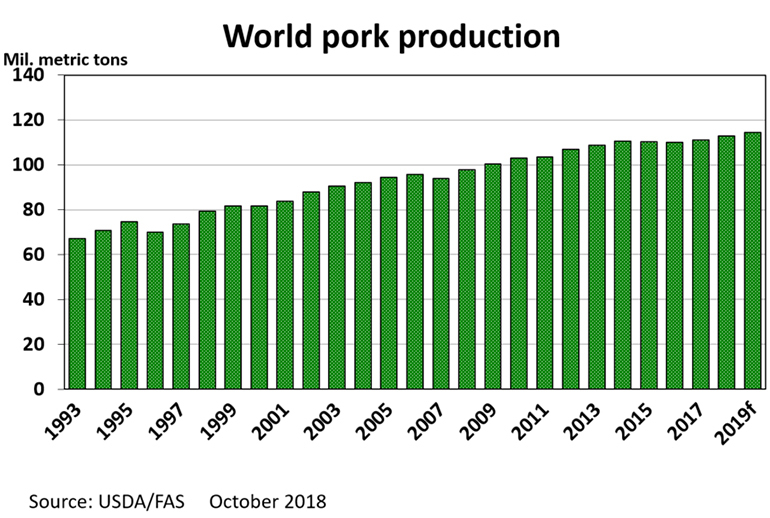 Chinese pork production in 2018 is estimated to be 1.4% lower than in 2013. Next year’s Chinese pork production is predicted to be up 1.2%, but it will still be less than in 2014, which was the peak year for pork production in China. The European Union, with 28-member nations, accounts for 21% of world pork production while the United States produces a bit under 11% of the world’s total. Brazil is the fourth largest pork producer followed by Russia and Vietnam. U.S. pork growth has been rapid in recent years. USDA estimates 2018 pork production to be up 13.9% compared to five years ago. Of the top 10 pork-producing countries, only Russia and the Philippines have increased at a faster rate in the past five years. 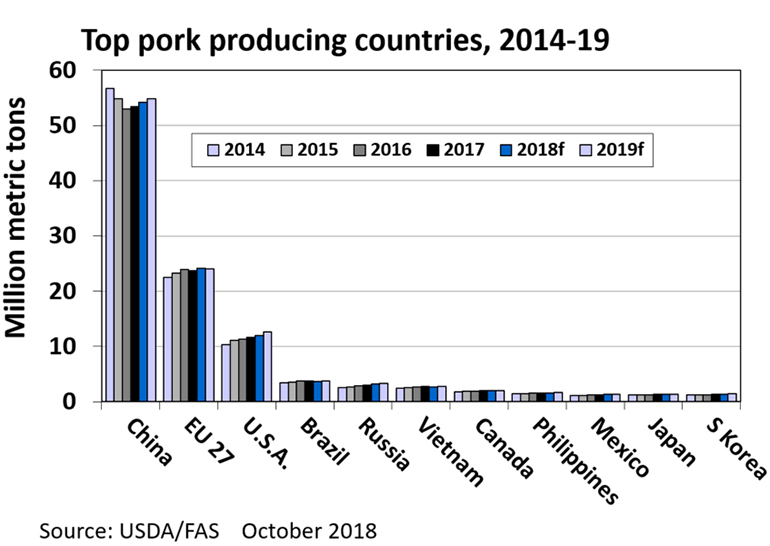 USDA is predicting a 5.2% increase in U.S. pork production in 2019, which is expected to be the biggest increase of any of the top 10 pork countries. The amount of pork moving in international trade continues to increase. World pork trade in 2018 is expected to be a record 8.5 million metric tons, up 21.8% from five years ago. 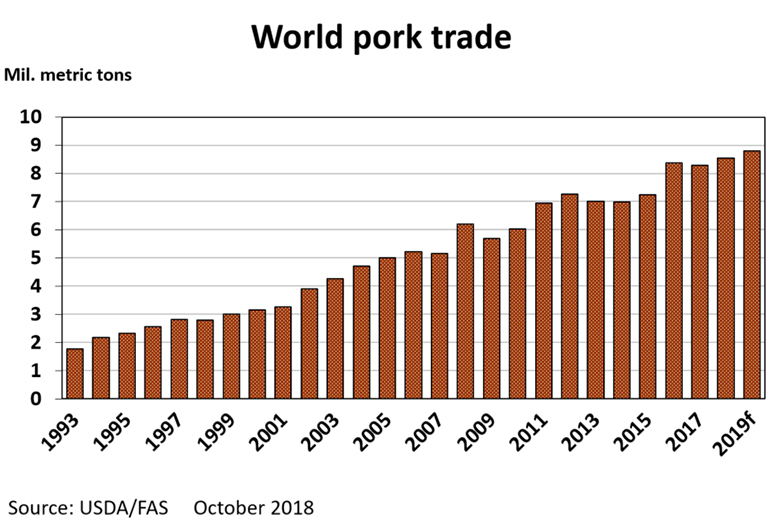 World pork trade is predicted to increase by 3% in 2019. It is especially important to the U.S. pork industry that world pork trade is expanding. Since U.S. production is growing much faster than the world total, increased exports are the best way to keep the U.S. pork supply from becoming overly burdensome on the domestic market. Recent trade data supports USDA’s optimism about U.S. pork exports in 2019. In August, the United States imported 82 million pounds of pork and we exported 438 million pounds of pork. August imports equaled 3.5% of the month’s U.S. pork production and exports equaled 18.9% of production. U.S. pork imports have been below the year-earlier level for the last four months while exports have been above the year-earlier level for 13 months in a row. In August, U.S. pork imports were down 18% year-over-year due mostly to a decline in shipments from Canada and Poland. August pork exports were up 5% with more U.S. pork going to South Korea and Japan, but less to Mexico than in August 2017.